Each of us being here today -as representatives of different stakeholders- is making social dialogue a reality. 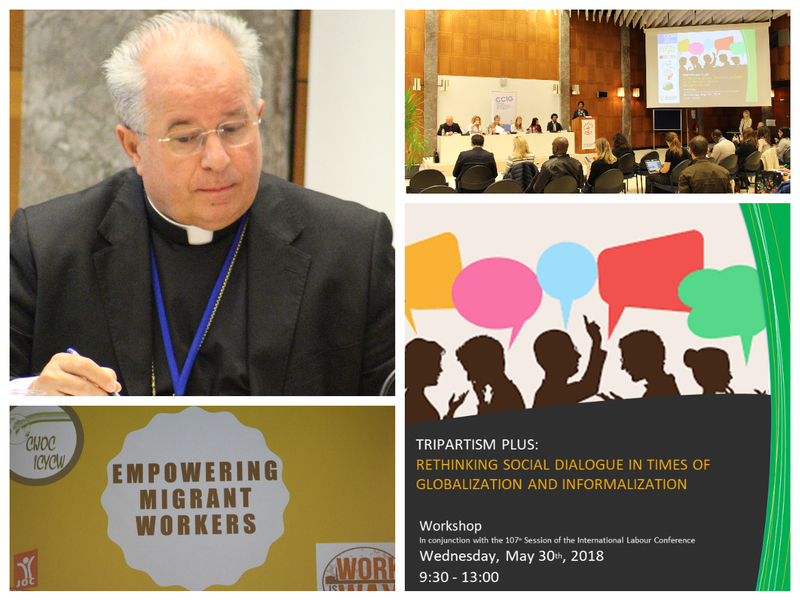 The NGO workshop entitled “Tripartism plus – Rethinking Social Dialogue in times of globalisation and informalization” was jointly organized by the International Catholic Centre of Geneva (CCIG), Kolping International/the German Commission for Justice and Peace (GCJP), the International Coordination of Young Christians Workers (ICYCW), International Young Christian Workers (IYCW), and the World Movement of Christian Workers (WMCW), with the collaboration of Women in Informal Economy: Globalizing and Organizing (WIEGO). Furthermore, the event was made possible with the support of the World Council of Churches (WCC). Social Dialogue can act as a mortar to keep society together. Nevertheless we see critical and increasing deficits in the commitment to social dialogue at all levels. Government structures are often weak and lack resources. In many countries the private sector refuses to recognize its importance. Labour movements are often too fragmented and weak to participate effectively. In conjunction with the 107th International Labour Conference, this event intended to raise awareness about opportunities and challenges associated with social dialogue, highlighting its potential and limits in our societies, as well as to facilitate a creative discussion on the different positions and approaches to reinforcing Social Dialogue within and beyond the ILO, at the national and local level. The coalition of organizing NGOs believes social dialogue is a critical instrument for advancing the rights and protections of workers in the informal economy that should be at the forefront of advocacy efforts on the issue. This workshop convened prominent members of civil society, the ILO, and actors in the field, to create a space for dialogue among concerned stakeholders and advocates. Speakers, H.E. Mgr. 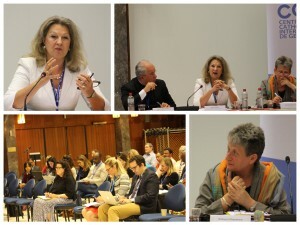 Ivan Jurkovič (Apostolic Nuncio, Permanent Observer of the Holy See at the UN), Ms. Jane Hodges (Former Director, Gender Equality, ILO), Ms. Leizyl Salem (Asia Pacific Coordinator, IYCW), Ms. Floriane Rodier (National Secretary, YCW France), Ms. Lorraine Simbanda (President of StreetNet, ZIMBABWE – partner of WIEGO), Ms. Odile Frank (Representative, Global Coalition for Social Protection Floors), Ms. Anna Biondi (Deputy Director, Bureau for Workers’ Activities, ILO), Ms. Sarah Prenger (International President, IYCW) provided inputs and testimonies regarding the challenges of social dialogue based on their experience at the local and international level, eventually opening up the discussion to members of the audience. Ms. Hildegard Hagemann (Kolping International/GCJP) moderated the event. To read the full report on the workshop, including links to panelists’ presentation, click here. For more information on the topic, please consult ILO Reports “Social Dialogue and Tripartism” and “Ending violence and harassment in the world of work”. No Comments to "Tripartism plus – Rethinking Social Dialogue in times of globalisation and informalization"